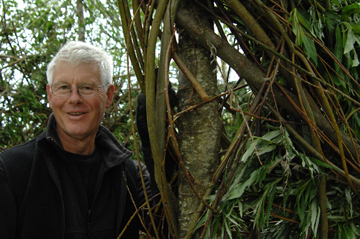 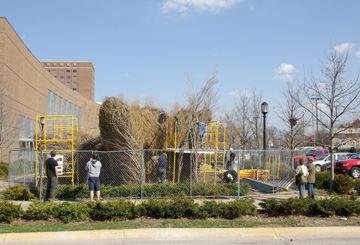 Visiting artist Patrick Dougherty worked with Purdue University students to construct a two-story high sculpture made from local natural materials during March 2011. 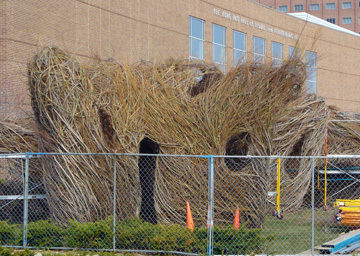 "Mr. Dougherty is known internationally for his site-specific monumental sculptures created from tree saplings, a locally harvested and renewable source," said Michal Hathaway, Assistant Director of Purdue Galleries. 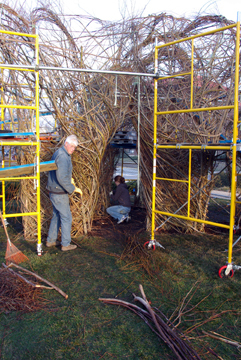 "The construction is performed on site and will be visible to all from start to finish. 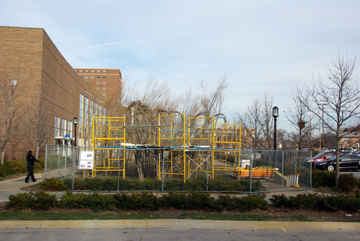 Once completed, it will stand for two to three years at the southwest corner of Pao Hall on Marsteller Street before being deconstructed and the materials returned to nature." 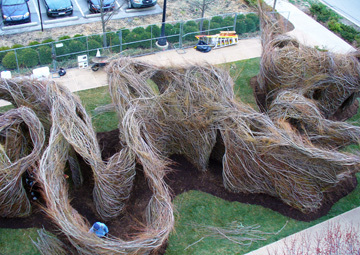 This project was a collaborative effort between the Department of Horticulture and Landscape Architecture and the Patti and Rusty Rueff School of Visual and Performing Arts. 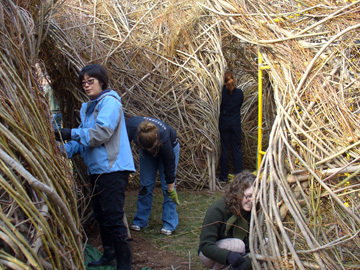 Twenty-seven students participated from the "Plants, Landscape and Art" class, which is taught by Ann Hildner, an assistant professor in landscape architecture, and Steve Visser, a professor in visual and performing arts. 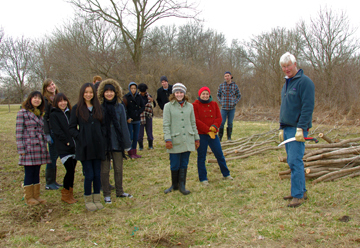 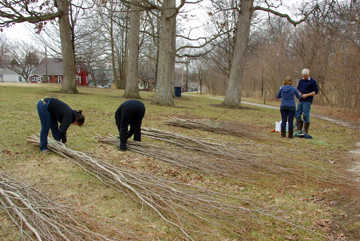 The students began collecting saplings from local woodlots on March 2, and construction began on March 7. 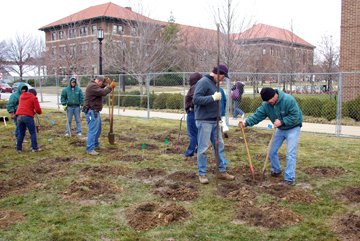 The team worked regularly from 9 a.m. to 4 p.m. on weekdays through March 25. 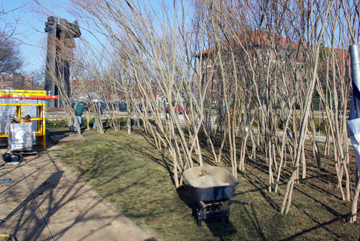 Construction also took place from 9 a.m. to 4 p.m. on March 12-13. 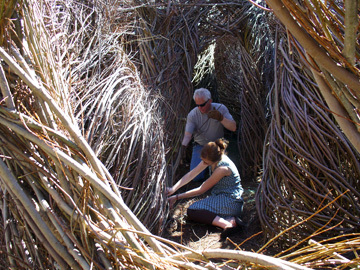 Visitors were welcome to observe and speak to the artists and students. 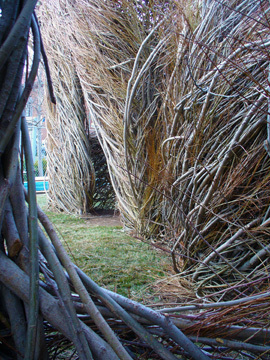 The students worked with Dougherty on scaffolding and weaving the flexible branches into a solid, twisting form that may stand two to three stories high. 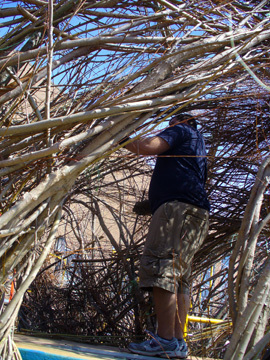 Dougherty's residency was supported by the College of Liberal Arts, Patti and Rusty Rueff School of Visual and Performing Arts, the Florence H. Lonsford Fund, the College of Agriculture, Department of Horticulture and Landscape Architecture and Bookwalter Fund.